Over a three year period from June 2012 through until March 2015, Uranus harbinger of the Great Change and Pluto, in its destroyer aspect, have been systematically moving in and out of a close square – it reaches its critical, exact point on 15th December, 2014 The purpose of this square is the restructure of our inner selves and ultimately our global society. You may recall the tension of this square between June and September 2012; and during May and October 2013. Once again now, in November 2014, Pluto in Capricorn strips away old, outmoded foundations in our lives. Meanwhile Uranus in Aries blazes a trail of Light for us to follow, if we dare. Throughout November and December 2014, we will experience the next phase of this planetary tension. Reflect upon the changes in your life since June 2012. What have you released? What courageous actions have you taken that have moved your life forward in leaps and bounds? How have you responded to this call to recycle the old in your life? If you have begun the process of embracing change, then no doubt you will be able to see your progress thus far, as your past has been released or recycled. Irrespective of which area of life has been under your soul’s spotlight – attitudinal, physical, emotional, relationships, financial, health, career, family – now is the time to acknowledge and celebrate your success thus far. Then prepare to take the next step. Finding the inner courage and conviction to respond to the transformational energies of Uranus and Pluto is not always easy. In hindsight, you may find that you don’t even miss what has been stripped away; in fact you may even feel joyful around the breakthroughs/loss, however hard your journey over the last couple of years has been. Now is not the time to rest upon your laurels. Collectively we have weathered four of these Uranus/Pluto squares – two more to go! Consider the restructuring that has occurred thus far in your life, and in society en mass, as being a six step process. This stage of the restructure will not be complete until March 2015. Reviewing the last couple of years may help to remind you how far you have come. Reviewing may also stimulate you to further courageous action. Having made some progress, the next step may now be revealed to you. Irrespective of your age, gender, nationality, religion – we are all in this together – there is inner and outer work to do. The purpose of this Uranus/Pluto square is to release the outer layers; and expose the inner kernel, the soul purpose of your life. The purpose of humanity’s existence on earth is to recognize and begin to act as if we are all one family, one humanity, one brother/sisterhood. By reflecting on your own life the next area that needs your attention may become apparent. It may be that more loving kindness is required in a relationship; or forgiveness of an old enemy may be in order; or greater self-love and self nurturing may be required. It could be that you are called upon to care and protect animals or the earth. Everyone’s focus is different and yet together we are one humanity. We have only one earth upon which we reside. When viewed through the astrological lens, you may find that some of the challenges, pain, suffering or loss that you have experienced in the last couple of years have now revealed their deeper purpose. As a member of the human race we all have a dharma/spiritual duty to move closer towards the Heart of all Love. To feel loved and to share love; to trust and open to love; to pray that you are used as a vehicle for goodwill on earth – these are just a few of the myriad ways we can open to Love. The social, environmental, political and financial turmoil we see all over the earth exists because of the lack of goodwill and love within humankind. 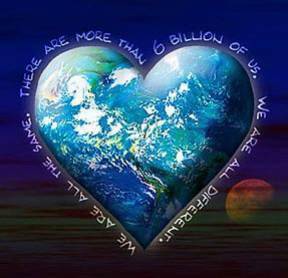 We are in the midst of an enormous struggle to birth our collective heart consciousness. This struggle, this birth is known as the Great Change, and the entire process spans several hundred years. By focusing upon our individual progress and celebrating the change in our individual lives; we aid the collective hope and the birth of loving kindess on earth. We are in the midst of a spiritual revolution, however this spiritual birth is rarely documented or celebrated through mainstream media outlets. It is up to us to celebrate the Light, the joy and progress in our lives. When we celebrate we share this Light and this joy, then it flows through us to those in need. Through such a celebration and sharing we unite to collectively hold Earth’s light on high. In this way we can successfully navigate the darkest hours before the dawn. Hope springs eternal. Over the last couple of years I have personally experienced great joy and also loss. In the midst of great joy I often find that words spontaneously flow through me to the world. Arjuna Govinda has put some of these words to beautiful tunes. Within them can be found seeds of hope, love, joy and forgiveness. If you find that they lift and inspire you please share. If you are having trouble navigating the changes in your life consider a consultation with Chandra.